Cusco is famous not only for its ruins, also for its people and their customs. 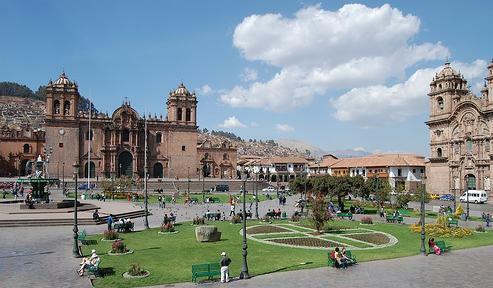 Cusco was the Capital of Inca Emperor and it is still the capital of Culture in Peru. Other than Machu Picchu Cusco is the most attractive place for tourists in Peru. Whether in day or night, Cusco is always a city full of charms and attractions. You will find plenty of places to visit inside and around Cusco. If you like history, know something about great Inca, it would be a place of great attractions for you. You can see lots of colonial buildings, real Inca walls, statue of great Inca Emperors and what not! Here I am listing the great places you must visit. If you are in Peru you must know Plaza de Armas. In all cities they have a place with this common name, which is like the center of the city. Plaza de Armas of Cusco is more famous than any other Plaza de Armas of other cities in Peru, because this one is the historic center of not only Cusco but of whole Peru. It was the central plaza at the time of Inca period. This place is also known as Main Square, Central Square. At the periphery of this plaza you will find colonial churches, museums, restaurants, pubs, bars, travel agents and what not. Peru is a city of churches. Cusco is no different. But you will really be amazed with the artistic designs of the churches here. In the pictures above you can see Catedral of Cusco (on left) and Iglesia de la Compania (on right). Click for more on churches in Cusco . They have lot of museums in Cusco. But I think you would like to visit historical and religious ones. Cusco regional history museum is only two blocks from the central square. This museum is housed in the original residence of great writer Garcilazo de la Vega. Another one is Archaeological Museum of Cusco. If you like to know Inca culture, Inca pottery, Inca textile - this is the place you must visit. This one is also near to Central Plaza, only two blocks away. If you are in Cusco, I recommend you to keep this place in top of your list. it is one of the most colorful places in Cusco. Now, what is San Blas! Why you have to visit this place. See the picture above, yes it is famous for its zigzag, narrow and steep streets. 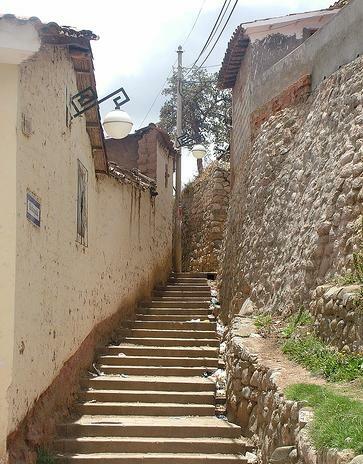 And the colonial houses surrounding the streets are old, and made of original Inca walls. This area is only 15 minutes (on foot) distance from central square. Don't miss it.